This bar was so intriguing (and tasty, of course) that we HAD to put it into a Mystery Chocolate Box. It’s actually the first bar that we’ve tried that has included its, well, inclusions in the form of herbs. It’s sort of — or perhaps exactly like — herbal tea leaves stuck to the bottom of the bar. Now, if you remember from the letter included in this box, your mission is to guess the flavor of the herbs, not the herbs themselves. The flavor included (or at least the important flavor) is not “tea” or “leaves” or “herbs”. It’s the flavor carried BY the herbs. Now, of course, in addition to the interesting method of flavoring this bar, the chocolate is also fantastic. Single origin from Ecuador and although it’s on the darker end of the spectrum at 80%, it’s not overly bitter. This is Villakuyaya’s rookie MCB effort but it definitely won’t be their last! We’re off to a good start here, let’s keep moving! This was a more traditional dark chocolate bar. 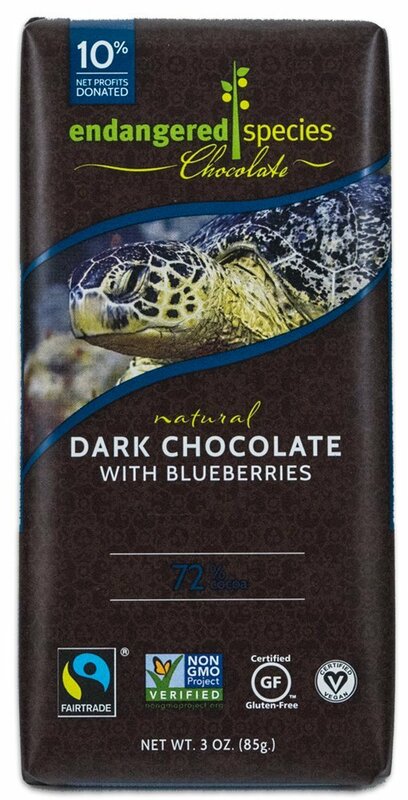 It has a lower cacao content (72%) but what we think they do a really good job of here is giving it just enough sweetness to avoid scaring off the milk chocolate loving crowd while retaining an undoubtedly dark chocolate taste. We loved the soft, sweet inclusion in the bar. We’ll go ahead and say it’s a fruit — one that has become a favorite of ours because of its softness. It really gives a great contrast to the firm dark chocolate and that makes for a very enjoyable eating experience. Blueberries aren’t one of the first fruits that you might think to pair with chocolate (unlike, for example, fruits like strawberries or cherries or raspberries) but we don’t think that’s for good reason! It makes a fantastic combination with chocolate and always pleasantly surprises us. Now, the last bar is waiting for us! There isn’t really much to say about this bar but holy goodness this was a seriously delicious chocolate bar. It combines essentially three of most peoples’ favorite flavors. And they all combine perfectly to make a dangerously delicious bar. In fact, it’s so good that I actually do NOT like one of the flavors that you’ll see below, but I STILL ended up loving this bar. So that says a lot! Milk chocolate. Peanut butter. Banana. Yeah, like we said: three of most people’s favorite flavors. And, in case you’re wondering (because you haven’t had this bar yet, of course), they do combine together as amazingly as the way you’re fantasizing about. One of the best milk chocolate bars we’ve ever featured! Hope you LOVED this box and are looking forward to the next! No Replies to "January 2018"